I am adding a new category to my blog for things that I have spent too long looking for online. This entry was posted in Memory Hole on August 28, 2009 by TGK Admin. This month has been huge at TayloeGray. We have two great new client, ACT Medical Group and Swim Envy. Both need brand new website by the end of August, so it is going to be a busy month. Swim Envy sells designer swimwear and accessories and ACT Medical Group place clincians in assisted living facilities. Not too much of an overlap, but they are both going to be great projects. This entry was posted in Uncategorized on July 31, 2009 by TGK Admin. I have started a new consulting firm, TayloeGray, with Nathan Tayloe. Please visit my new company website, for more info. For now I will be blogging over there. This entry was posted in Uncategorized on July 3, 2009 by TGK Admin. Why use powerpoint when you can rap? I was preparing for a talk to Jonathon Rowe’s entrepreneurship class on Wednesday, working on my slide deck, and staying up late on a Sunday night. I will be giving a lecture on SEO for the undergrads in his class. While taking a break to catch up on digg, I found that someone had already pretty much done my whole presentation in a rap. I might just play this on the screen, drop the (figurative) mic, and go home. Not sure if I would be invited back, but I think I would get the same point across. Almost 1/2 million views when I found it, not bad. This entry was posted in SEO and tagged nerdcore on April 6, 2009 by TGK Admin. Matt Magne, Nathan Snell and I have been playing around with the idea of having a regular event where IT and technical people can get together to talk about technology with other like minded people. This is the first of such meetings. It is going to be casual and you should come as you are from work or your home office. You can get more details here: wilmiti.com where you can join the facebook group. Come out an meet other IT professionals in a casual atmosphere and talk tech topics. We have reserved a side room for the event and City Tavern has a full bar and great food. Come by on your way home from work, or get out of your home office and come join the event. This is the first of our rotating monthly events. This entry was posted in Technology on March 29, 2009 by TGK Admin. How do I create backup images of Windows and Linux Servers? I am looking for the answer to this question. Does anyone know the answer? We have a small office network with four Windows 2003 servers and two Gentoo Linux servers. What is the best software tool for me to make complete images of the hard drives of these machines? Everything is working great and I would like to know if we had a catastrophic hard drive failure, I would not have to recreate the machines from Backups (done daily to Tape and HD) and OS install disks. All machine have either mirrored or Raid 5 SATA drives. We use Symantec backup exec for the backups. There is probably at total of 500 GB of data including all the OS install across all the machines. Is there a cost effective way to image these drives and store the images in case of emergency? Also, is it possible to make images that could be run virtually in case of emergency? Do any of the tools have a way to update the images automatically in the future? This entry was posted in Technology on March 23, 2009 by TGK Admin. Even though North Carolina currently has one the highest unemployment rates in the country, “North Carolina and Wilmington are positioned well for long term growth,” said Dr. Matthew Martin, Economist for the Federal Reserve Bank of Richmond, Charlotte Branch, at an event hosted by the Cape Fear Chapter North Carolina World Trade Association on February 18th. Martin presented economic data to back his assertion that the current recession is more sever than the previous two and even if the recession officially comes to an end this year, recovery will take some time. Wilmington is coming down from 6% GDP growth, the highest in the state, said Martin. 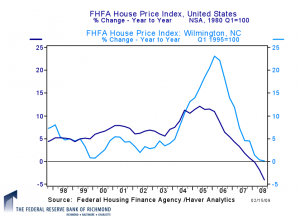 Martin presented data from the Federal Finance Housing Agency, that showed Wilmington’s year to year change in home prices peaked in 2006, at approximately 24%, and have basically fell to zero in Q4 2008. 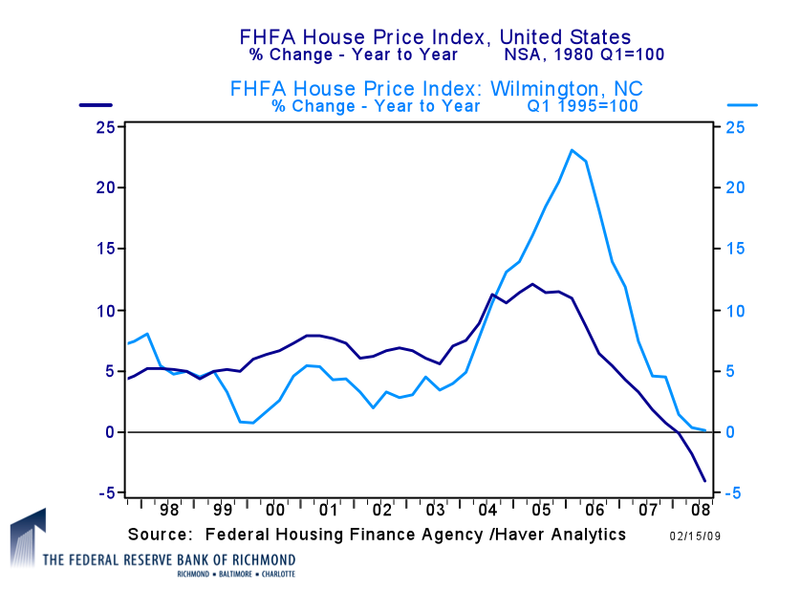 This compares to a national peak of 11% change in 2006 and national average rate change of -4% in the same period. Wilmington is not the same as Phoenix or Las Vegas or other markets, said Martin, but there is “still room for house prices to decline in this region in 2009.” Martin also presented data from Bureau of Labor Statistics that show that Wilmington’s total nonfarm employment grew faster than the national rate since 2002 and has fell at a lower rate than the national average in 2008. Martin’s data has year to year change in nonfarm employment in Wilmington around -1% and -2% nationally in 2008. Martin stated, the Fed is using it’s balance sheet to provide liquidity to various financial markets with an aim of stabilizing financial markets and promoting growth and that with core inflation at 1%, “the Fed has some room for expansionary monetary policy”. Martin stated that there is nothing to indicate that the long-term growth prospects of the US economy have been permanently damaged. Additionally he said there is already significant monetary stimulus in place, with significant fiscal stimulus likely in the coming months. As the year progresses, these will begin to have their effect. “The event exceeded everyone’s expectations and was very well attended, we are looking forward to our next event March 25th where the CEO of GE Hitachi Nuclear Enrichment will be our guest speaker at the The Balcony on Dock,” said Corey Heim, President, Cape Fear Chapter North Carolina World Trade Association. The North Carolina World Trade Association is pleased to host keynote speaker Tammy Orr, President & CEO, Global Laser Enrichment for GE Hitachi. Tammy will discuss current events and recent progress of GE global nuclear programs. Tammy earned a B.A. degree in Chemistry with honors from the University of North Carolina at Wilmington. She began her GE career as an intern with GE Nuclear in 1986. After graduation, Tammy joined GE as a senior control systems engineer. In this role, she provided technical support of the fuel manufacturing facility and was a key member of the team that designed, installed and operated a new $80M Dry Conversion Process. Following roles in manufacturing, Tammy progressed through several commercial leadership roles including account management and sales. In 2005, she became the General Manager, Quality for GE Nuclear Energy, with responsibility for all aspects of manufacturing, product and service quality for the global $1B nuclear business, which serves customers in North America, Europe and Asia. In June 2007, Tammy was named President & CEO, Global Laser Enrichment with responsibilities for licensing, commercialization and project execution. Tammy is an active member of the GE Volunteers. She lives in Wilmington, NC with her husband Rodney and two children, Watson and Kyna. Choose from the finest selections from a gourmet buffet provided by The Balcony on Dock. Guests will pay for only their own meal costs which is $12 plus tax and gratuity. Tea, coffee and soft drinks will be included. Reply to CoreyHeim@gmail.com by Monday, March 23rd, 2009, Please RSVP with the full name of those who are attending so a printed name badge can be made up prior to the event. This entry was posted in Biz Journal on March 20, 2009 by TGK Admin. There is not much that makes me more angry than creating artificial barriers to exit for the purpose of forcing clients to stay with you. Godaddy is a prime example of this. It is a huge pain to move a website and all the files away from them. I have a client who has outgrown Godaddy’s hosting and I am moving them over to MediaTemple, who provides scalable hosting for high traffic and database intensive websites. Each of these applications has a separate file structure and an individual database on Godaddy. Much of the content has been uploaded to the application and the easiest way to move the site would be to Zip or Tar the entire site, backup the databases and move the files over to the new hosting. I have probably done this thirty times in my life. It is pretty straight forward and most of the time is spent watching files transfer. Godaddy has made this impossible for the following reasons. This entry was posted in Tidbits, Uncategorized, Web Design on February 18, 2009 by TGK Admin. Let’s see the AP try and put this genie back in the barn or the horse back in the bottle. The funny thing is the creator of the poster, also create the “Obey” brand which was started using a bootlegged photo of Andre The Giant. 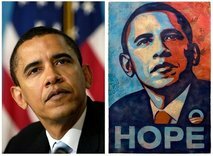 Shepard Fairey, the creator, has been on both sides of the copyright issue, and has tried to protect his images from duplication. I wish I still had the bootleg Radar has a posse, 1′ 4″ sticker that the previous tenants left in the rental home I moved into in 1998. The sticker was made for the neighborhood cat “Radar,” and included an image of a cat. 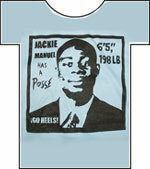 One of my favorite version is the UNC-CH t-shirt for Jackie Manual. This entry was posted in General, Tidbits and tagged IP, Obama on February 5, 2009 by TGK Admin. Aqua Plantations LLC, a Wilmington-based underwater agriculture, or “aquaculture” company, has developed a system for growing saltwater fish in tanks and is seeking investment capital to expand their business. Aqua Plantations raises black sea bass, a type of Grouper that inhabits east coast waters, in large recirculating tanks and sells processed filets under the brand name “Carolina Black Sea Bass.” The company currently produces approximately 3000 pounds of processed fish per year from their facility in Wrightsville Beach but hopes to secure investment and expand production to 200,000 pounds per year at an inland site near Wilmington International Airport. In the wild, black sea bass are normally caught in traps, which leads to inconsistent yields and size, said Ted Davis, company founder. In comparison, Aqua Plantation’s fish are raised in 8,000 gallon tanks and fed a diet of pellets when young and then twenty-gram tilapia after they grow past a weight of one pound. This system allows for uniform growth, and the fish are kept alive until the filets are ordered and processed. According to Davis, the two biggest challenges are keeping water quality and feeding protocol balanced and designing a recirculating system that can be used inland. Unlike inland freshwater systems, saltwater systems like Aqua Plantation’s cannot discharge fish waste on land. For example, tilapia is produced in fresh water tanks, and the waste can be spread on agricultural land as a fertilizer; however, the salinity of the black sea bass’ water prevents this use and requires more advanced systems to deal with the waste. This entry was posted in Biz Journal on December 15, 2008 by TGK Admin.